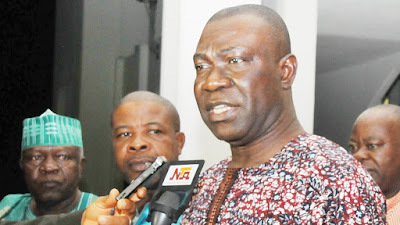 Deputy Senate President, Ike Ekweremadu, yesterday, paid a solidarity visit to four key officials of the Peoples Democratic Party, PDP., who are being detained by the Economic and Financial Crimes Commission over alleged graft running into billions of Naira. The four men-Senator Musiliu Obanikoro, Senator Bala Mohammed, Chief Femi Fani-Kayode and Dr. Reuben Abati, were taken into custody by EFCC at different times but were united in the cell by the common platform of their party, the Peoples Democratic Party, PDP. Reuben Abati served as President Goodluck Jonathan’s Media Adviser, while Fani-Kayode worked towards the end of Jonathan’s tenure as the Spokesman for his Presidential Campaign Organisation. On the other hand, Obanikoro and Bala Mohammed served as Minister of State for Defence and Federal Capital Territory respectively and ended their tenure about two years ago. But they were hauled to the EFCC on various allegations bordering on mismanagement of public funds, particularly the $2.1 billion cash for the purchase of arms to fight insurgency in the North East. Obanikoro is linked with the N4.7 billion allegedly traced to firms close to him but he has already spoken out on how he paid the money out to Governor Ayo Fayose and former Osun Deputy Governor, Senator Iyiola Omisore, but it is not clear why the EFCC is still keeping him. On the other hand, Mohammed is alleged to have awarded contracts worth N8 billion to fronts and also abused a major land swap deal valued at about N1 trillion. Fani-Kayode and Abati are linked with collecting funds from the ONSA for undisclosed reasons. But the EFCC confirmed last night that it has granted what it called ‘Administrative Bail” to Abati on conditions that he drops his International Passport and produces a surety of not below the rank of deputy director in the civil service. A top source in the commission who confirmed the development, however said that the former presidential aide was yet to meet the bail conditions. “We will continue to keep Abati until he meets the bail terms,” the source told Vanguard. It was also learnt that while Abati was preparing to meet his bail conditions and return home, the commission had earlier in the day secured a court warrant to further detain Mr. Mohammed for undisclosed number of days. The source hinted that since his arrival, Mohammed had not given sufficient information relating to the issues he is being accused of and that the commission needed more time to interact with him. “We have obtained a new warrant to keep Bala Mohammed because we are not yet through with investigating the issues related to him,” the source hinted. Before then, at around 5 pm yesterday, the Deputy Senate President, Ike Ekweremadu, one of the highest elected PDP leaders in the country, visited the four men at the EFCC headquarters to identify with them. Findings by Vanguard showed that the DSP was received on arrival at the EFCC premises by the EFCC’s Deputy Director, Operations, Umar Abbasm who also took him round. According to sources close to the visit, Ekweremadu enjoined the four detainees to be of good cheer and to take their ordeal as a leadership challenge that would embolden them as servants of the people. “I urge you all to be of good cheer and to keep your spirit high because what is happening to you today happened to our great leaders like Chief Obafemi Awolowo, Dr. Nnamdi Azikiwe and other top Nigerians who stood for the good of the people of Nigeria,” Ekweremadu told the four men.